David Andrews is an American footballer who plays as a center for the New England Patriots. At the onset of his career, he didn’t make it into the National Football League (NFL) as a choice pick in the rounds of the 2015 NFL draft, however, for his resilience and impressive plays with the Patriots after he signed with them as a free agent, Andrews has proven to be a player to always watch out for whenever he is on the field. Let’s take a look below at the stuff he is made of. The Patriots innermost lineman in the offensive line was born on the 10th of July 1992 in Johns Creek, Georgia a northern suburb of Atlanta to Jeff Andrews (dad). He has a sister whose name is Kristen Andrews Birdsong and other than her, it is not known if he has any other sibling and in addition, his mom’s name has not been revealed. David Andrews had his high school education at Wesleyan School which is located in Peachtree Corners, Georgia. At the school, he played baseball and football but the latter got the better part of him when he became a first choice pick whenever and wherever football was being played and he lined out. Even as a kid, he had the right height and weight for which he was aptly named “boss”. The boss was a 2008 GHSA Class A state champion and in his junior and senior years, he was reputed for his solid knockdown blocks which no quarterback could go past in either season. David maintained his impressive play in 2010 earning the Gwinnett County Offensive Lineman of the Year as well as making Gwinnett Daily Post All-County First Team Offense. He was ranked a three-star recruit by Rivals.com and was the number 9 prospect in his class. This attracted offers from Duke University, the University of Michigan and the University of Georgia which he committed to immediately they made the offer. With the Georgia Bulldogs football team, David Andrews played 10 games in his freshman year, 4 more games in his sophomore and started all 13 games in his 3rd season protecting his team’s quarterback Aaron Murray. He earned the season’s Offensive MVP as well as making it on the list of Phil Steele Third Team All-SEC. David started 13 games in his final year of college with the Bulldogs so that at the end of his collegiate career, he won Georgia’s Vince Dooley Most Valuable Player Award and earned a place in the Associated Press All-SEC second team. David Andrews entered the NFL as a free agent signed by the New England Patriots on May 2, 2015, after leaving the 2015 NFL draft undrafted. He excelled in his new team’s training camp and more so in the preseason games being that the Patriot’s first choice center Bryan Stork and reserve Ryan Wendell were both down with injuries. He started his first season as a starter with a debut against the Pittsburgh Steelers. David maintained his impressive play throughout the season for which he retained his starting position in the 2016 season. In his sophomore year, David Andrews started all 16 regular season games and was a big contributor to their 14-2 season record. He also played in his first Super Bowl in this season – Super Bowl LI (February 5, 2017) against the Atlanta Falcons which ended in a victory for his side. Having impressed in his first two professional seasons, the Johns Creek born Center earned a 3-year contract extension with the Gillette Stadium Foxborough, Massachusetts based team. The contract entailed a signing bonus of $1.6 million, $2.1 million in incentives and a base value of $9.6 million. The contract will expire in 2020 and so far, Andrews has been playing up to his money’s worth. He played 17 games out of the total 19 in the 2017 NFL season during which he captained his team for the first time in his career on September 5, 2017. They lost Super Bowl LII (on February 4, 2018) to the Philadelphia Eagles but secured a place to fight for glory in Super Bowl LIII (February 3, 2019) against the Los Angeles Rams. In this season, he started all 16 regular season games for his side. Not much is known about David’s parents apart from his father whose name was obtained as Jeff Andrews. He is a known supporter of his son and has even said that David Andrews will coach in the NFL someday. Andrew’s adeptness at football can be seen as a family thing, his uncle Dan Reeves is also involved with the game but now as a coach. He previously played with the Dallas Cowboys, San Diego Chargers and Pittsburgh Pirates. He began his coaching career with Denver Bronco, served with the New York Giants in the same capacity before heading over to the Atlanta Falcons which he took to Super Bowl XXXIII. The footballer is married to his longtime girlfriend and best friend Mackenzie Dempsey. 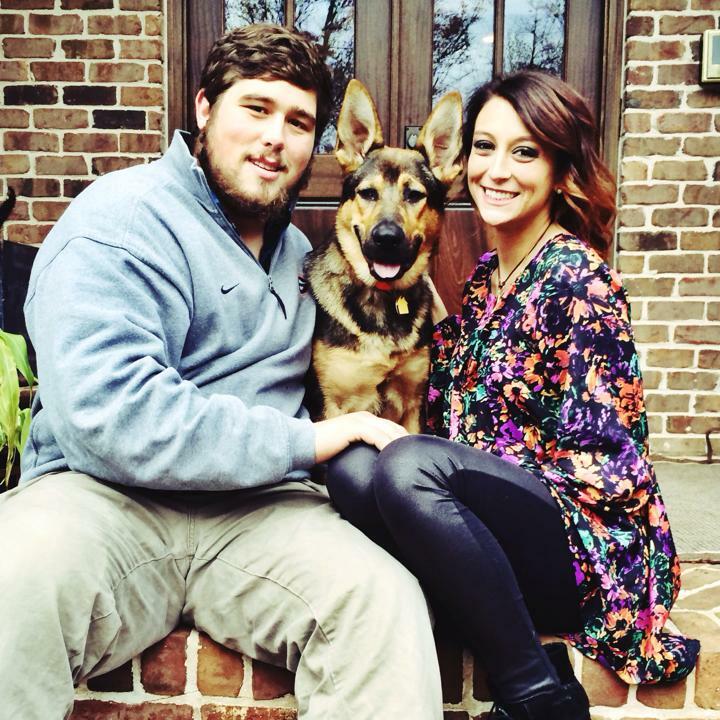 They started dating in 2013 and shared their first kiss at the General Beauregard’s bar in Athens. Their relationship lasted through college and sometime in October 2015, Andrew did something special. He proposed to his then-girlfriend (now wife) on the home ground of Georgia Bulldogs – Sanford Stadium. Her response was the obvious as they got married on April 8, 2017, at Walnut Hill Farm Event Center. They have remained married since and have been each other’s pillar in their respective careers. From what we know about Mackenzie Dempsey, she was born in Cedartown, Georgia where she grew up and graduated from Cedartown High School where she had shown great interest and passion in cheerleading. She was selected as one of the 150 girls who enlisted for the University of Georgia cheerleading squad. After making the cut, Dempsey cheered at the varsity’s football, volleyball, basketball games, and gymnastic events. It was in one of the several football events that she cheered that she met David Andrews who was playing with the Bulldogs. In 2015, Mackenzie graduated from UGA’s College of Public Health earning a Bachelor of Science in Health Promotion. She subsequently earned her master’s degree in public health from Georgia Regents University and has since then been practicing at the Spaulding Rehabilitation Hospital in Cambridge, Massachusetts. David Andrews stands at a height of 6 feet 3 inches or 1.91m, he is quite a big man weighing 300lbs or 136kg. In his pre-draft, the Patriots Center weighed 295lbs or 134kg while his height was 6 feet 2 inches or 1.89m. His other body measurements like his biceps, chest, and waist measurements have not been revealed.